In reality, color doesn't actually exist - color is simply a figment of your imagination. No I'm not joking, serious. COLOR DOES NOT REALLY EXIST!!!!!!!! So what about blue and green and orange? Figments of your imagination. Confused? Light, an electromagnetic wave, can come in different wavelengths. These wavelengths enter your eye and the energy gets absorbed by cells on the back of your eye. This light energy then gets converted into chemical energy, gets processed by a few hundred million specialized neurons, and after a few fractions of a second magically your brain says wavelength 450nm is blue and wavelength 520nm is green (much more useful information, anyway). At the conscious level you never actually see these wavelengths, only what your brain processed them as. Through this process a lot of other wavelengths get rejected, too, such as infrared or ultraviolet. These wavelengths also exist, but you just can't see them. For more information on how your brain can 'see' check out my computer vision tutorials. So what's the point of this rambling? Stop thinking of light as something visible, and start thinking of light as colors you both can and can't see. Green is a color, but infrared is also a color. Once you realize the color green is no different than the electromagnetic waves your cell phone uses, then you will start to understand how a robot really can 'see.' For example, what would the world look like if you could see infrared but not blue, green, and yellow? Exactly. Again, objects don't actually have any color - its a figment of your imagination. For example, when you look at a red apple, the apple isn't actually red. Instead, the molecular surface on the apple reflects wavelengths that appear red in your brain and absorbs the other wavelengths molecularly so that you can't see them. Now if your robot wanted to see a red apple, how would it do this? I bet you would guess, 'Well, I need a sensor that can see the color red.' Wrong! Actually, you need a sensor that can tell the difference between red and another color. For example, suppose your sensor can't see red but it can see all other colors. If this sensor saw nothing, then it was looking at red. 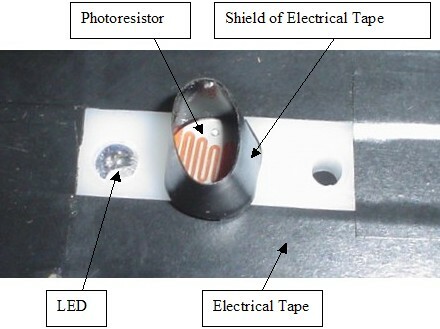 Suppose you have a sensor that can see many different colors, such as a photoresistor. How would you use this sensor to detect red apples vs. green apples? Well, consider brightness comparisons. Red apples reflect red light but absorb green light. Green apples reflect green light but absorb red light. If you shine a red light (such as from a red LED) on both apples, the red apple will reflect much more light than the green apple. As such, the apple that appears the brightest to your sensor will be the red apple. If you shine green light from a green LED on both apples, the green apple will appear the brightest. Suppose you had some M&M's and you wanted your robot to tell the difference between the blue, green, yellow, and orange candies. How would you do this? Well, get a blue LED, a green LED, and a red LED. 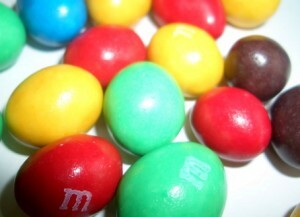 Then shine each onto the M&M's, one light at a time, and record the brightness values. Obviously, the blue M&M's will read the highest brightness values when the blue LED is turned on, but very low values otherwise. The green and the yellow M&M's can be detected in a similar manner. So how do you tell the difference between the yellow and the orange M&M? Well, the orange one is closer to red in the light spectrum, and as such will reflect more red light than the yellow one. But it gets a little more complicated . . . first, photoresistors have different levels of sensitivity to different colors. Typically photoresistors are optimal and peak at around 520nm. They are also sensitive to distance away from the target. As you can see, this particular sensor can detect the most light, and hence get the best readings, at .12 inches away. This information can be obtained from the datasheets. If you move the object to a different distance, or change the angle of the object, the reading will also change. And yet it gets more complicated. The ambient light (for example, sunlight coming in through your window) can change throughout the day. You will need to shield your sensors from this light. In reality you must calibrate your sensors before they will work. This means you must use your sensor(s) to sense the object, record the readings, then make a chart using this data. That way when your robot is doing its thing and senses the same object, it can compare the similarity of the new reading vs. the calibrating reading. For example, suppose your robot needs to follow a white line on a grey floor. Your robot would use a microcontroller to sense the analog value from the sensor. During the calibration phase your robot measured an analog value of 95 for the grey floor, 112 for the white line, and then stored these values in memory. Now your robot is on the line, and a sensor reads 108. What does that mean? Is it on the line or not? Using the thresholding method, you add both calibrated numbers and divide by two to find the average middle number. For example, (95+112)/2 = threshold. Anything above that threshold would be the white line, and anything under would be the grey floor. You can use this method for any color and any number of colors, given that you do a calibration beforehand. Consider calibration as a way of teaching your robot the difference between colors. Programming your color sensor is very easy. You simply turn on a LED with a digital output pin, wait about 50ms for the photoresistor to change (photoresistors are much much slower than infrared sensors), take a reading with an analog pin, then turn off the LED (if you have more than one LED). Now using a similarity-matching algorithm, with precalibrated numbers, your robot can then identify the target. What is the difference between bright green and dark green? The only difference is that with bright green there are more electromagnetic waves being detected and/or emitted. For example, suppose you have a green apple and your robot takes a green color measurement. Then you move the apple an inch back and take another measurement. What will happen? Simple, less green light from the apple will reach your sensor. So how is this useful? Range detection! Going back to the previous chart, can you see how you can calculate distance from an object? Unfortunately your color range sensor won't have a range of more than a few inches at most, depending on the brightness of your LED. You could of course use a green laser pointer for maximum range, or apply a trick I am about to show you. This following trick employs the same method TV remotes use to increase sensor range. Normally, if you apply a large amount of power to an LED to increase brightness it will fry. But what if you put a huge amount of power into it but over a very short period of time? Then you could make it say 5x brighter for ~5x increase in range! Power (watts) is voltage x current. A typical LED can only work at a few 100 milliwatts before they fry (check your datasheet) - this is why you should always put a resistor in series with an LED! Now watts is a measurement of energy divided by time: energy/second. So what if we had the LED shine for only 50ms? Well, that's 1 / .05 = 20, or 1/20th of a second. This means that if you shine your LED for only 50ms, then it can take about 10 to 20 times more current, and therefore shine about 10 to 20 times brighter. The exact numbers would depend on the thermal cooling rate of the LED - something that can only be determined by frying a few LEDs with testing . . . Just so you know, its quite common to find half an amp going through a TV remote IR emitter! There is yet another method to increasing detectable range of your sensor called modulation. It's somewhat complex so Ill write about it in another tutorial, but it requires a very fast sensor. Basically you switch your emitter on/off really fast so your sensor can therefore ignore background noise. As such you need a fast sensor. Infrared sensors respond within microseconds, but unfortunately photoresistors respond within milliseconds (bad!). If you were to do modulation, it would be better to use IR, such as a Sharp IR Rangefinder. Unless . . . 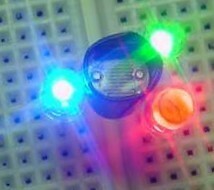 Unless you use these neat color sensors that are made by TAOS. So this concludes my color sensor tutorial, I hope you learned something!